When a vital system fails or is interrupted, your business operations are significantly impacted. Few electrical or mechanical failures occur without any warning signs. They are typically proceeded by changes in operating temperature. Infrared thermography offers an efficient way to locate changing conditions. This non-invasive survey can identify potentially dangerous conditions such as loose or dirty connections, overloaded or imbalanced circuits, or improperly installed equipment. 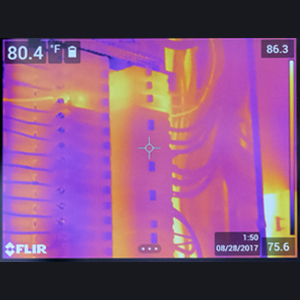 Infrared testing will locate hidden trouble areas – the “hot spots” – and allow you to make corrections before a failure occurs. Using infrared technology as part of a predictive maintenance program results in reduced downtime, avoiding emergency repairs, and saving maintenance dollars. 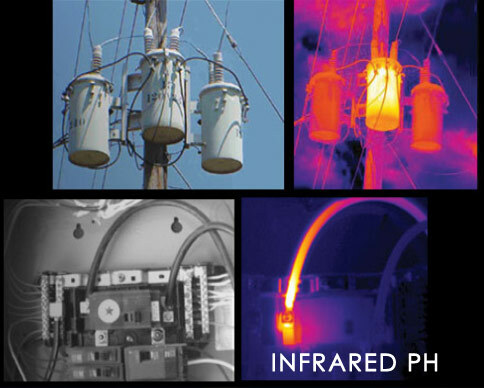 Infrared thermography can be used to monitor the condition of structures, machinery and systems. It is a predictive maintenance technique using a specialized camera that monitors the emission of infrared energy. Effective infrared surveys require specialized equipment and qualified technicians. Experience and training is required to accurately identify problem conditions and possible causes so that specific recommendations can be made to correct the situation. We are experienced. Windemuller has been conducting Commercial Infrared Surveys since 1993. Windemuller has both Level I & Level II Certified Thermographers on staff. WTS thermographers are trained & certified through The Infrared Training Center. ITC is the customer training arm of FLIR Systems, the global leader in Infrared cameras, night vision, and thermal imaging systems. See infrared report samples and certification documentation. Contact us today to discuss preventative maintenance for your business. In a commercial electrical emergency, we offer 24/7 support to our customers. Login Here or contact your account representative for assistance.